A FORMER LEADER of the UK Conservative Party has inflamed tensions over Brexit with Spain over British territory Gibraltar by invoking the spirit of the Falklands in a series of interviews. A draft of the EU’s Brexit strategy has suggested that Spain could have a veto over any trade deal with the UK unless it gets a say on the future of the tiny territory, situated on the southern tip of Spain. Gibraltar has been a British Overseas Territory for over 300 years since the Treaty of Utrecht was signed in 1713. Yesterday, speaking to Sunday Politics on BBC TV, Lord Michael Howard said that the only response open to the UK in these circumstances is to “stand by Gibraltar”. And I’m absolutely clear that our current woman prime minister will show the same resolve in relation to Gibraltar as her predecessor did. Later, Howard clarified to Channel 4 News that he wasn’t in fact suggesting that the UK go to war with Spain, but that he couldn’t “see any harm in reminding them what kind of people we are”. It was the second such military-hint in the space of a day, with UK Defence Minister Michael Fallon also telling the BBC that Britain is going to “look after” Gibraltar, and is prepared to go “all the way” to do so. Fallon also said that the people of Gibraltar, population 30,000, had made it “very clear” they did not wish to live under Spanish rule. Gibraltar did, however, vote by a margin of 96% to remain within the EU during last year’s Brexit referendum. 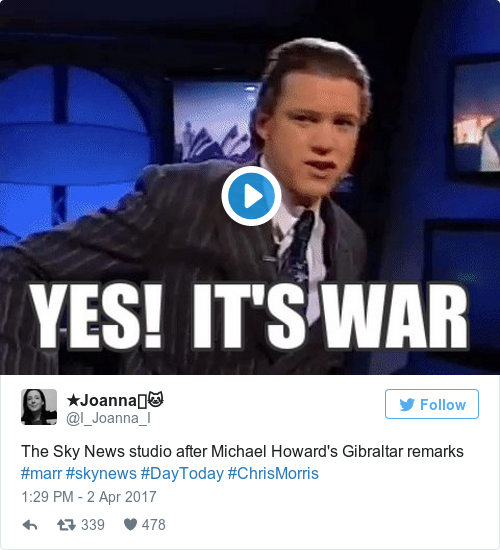 Howard’s words have caused something of an online storm with people wondering how the war of words has managed to escalate to such an extent so quickly. If one thing shows the lunacy of leaving the EU it must be Michael Howard talking about war with Spain, just four days after we give notice. Michael Howard talks of 'standing by the people of Gibraltar'. So does he want to honour their 96% vote to remain in E.U.? Meanwhile, Conservative Dominic Grieve, the chairman of the UK’s Intelligence and Security Committee suggested that Howard was being “a little bit apocalyptic”. “We have no evidence at the moment that the Spanish government would seek to invade and take over Gibraltar,” he said. That said, it is right to point out that with all our overseas territories, and that includes Gibraltar, if they were ever to be attacked we would go to war. That is stated United Kingdom Government policy. Yesterday, Prime Minister Theresa May told Chief Minister of the territory Fabian Picardo “we will never enter into arrangements under which the people of Gibraltar would pass under the sovereignty of another state against their freely and democratically expressed wishes”. However, May had stopped short of including a specific provision, at Picardo’s request, regarding Gibraltar in the letter she sent to European Council President Donald Tusk triggering Article 50, and therefore Brexit, last week, suggesting at that time the idea of the territory becoming a bargaining chip was far from her mind. As things stand, and trade agreement between the EU and the UK would have to be approved by all EU parliaments, effectively giving each member state a veto on the deal anyway. Reacting to the fallout from Howard’s comments, Picardo told RTÉ’s Morning Ireland today that he couldn’t understand why the EU had included the sentence regarding Gibraltar in its draft strategy when all the territory does is “provide 12,000 jobs for people every day”. He added that “given the way the EU has slapped us about the face on Friday”, he thinks that if another Brexit referendum were held in Gibraltar the EU “wouldn’t even get close to a majority if the vote happened today”. “We think we can do very well in the Commonwealth, 90% of our trade is with the UK,” he said. However, Picardo added that he doesn’t “want Europe to be a place that is visited by war”. Email “Former Tory leader inflames Brexit tensions with Spain over Gibraltar by bringing up the Falklands”. Feedback on “Former Tory leader inflames Brexit tensions with Spain over Gibraltar by bringing up the Falklands”.